It&apos;s already proved a massive success on the iPhone, with 82,000 downloads to its name and now Skobbler, the free open-source sat nav app, is rolling out to Android phones too. Skobbler is unique in that it is user driven…. We gave you a sneak preview last month but now it’s official. The first satnav with a built-in TV is here. Actually the first two satnavs with built in TV are here as there are two different sized versions – the Mio Navman V735 which has a huge 7-inch screen and its little brother, the V505 which has a 4.7-inch screen. Apart from the unique TV function, there are plenty of other features to justify the price of £299 for the V735 and £229 for the V505. Navigation-wise it’s got everything you’d expect from the Mio Navman brand including TruMaps, smart economical routing, traffic data and safety camera data. There’s also a nice walking navigation side to the device with built-in 2D city maps specially designed for pedestrians. 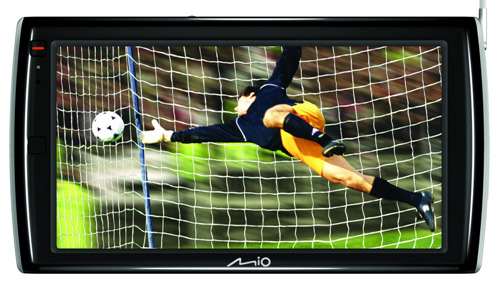 Like other Mio Navman devices it also includes the NavPix geo-tagged photo navigation feature. This feature, combined with the walking navigation maps will come into its own on city breaks. But you’re not really interested in all that are you? You just want to know about the TV aspect to the device. Well, it’s pretty straight forward – it has a built-in DVT tuner that will work right across Europe. In the UK that means you could pick up the complete Freeview spectrum, signal permitting. There’s a built-in aerial and there is also a socket to plug in a stronger aerial if required. Obviously it’s not designed to be used whilst driving – that would be very naughty. For under £300, these models have come in a bit cheaper than we expected. Get yours direct from Mio Navman. Is it a bird? Is it a plane? No, it’s….the Nav-Mat – the latest “crime-fighting device”. This is one of the strangest satnav accessories that I’ve come across. Its makers claim that “tell-tale sucker marks on windscreens” are one of the major reasons for satnav theft. 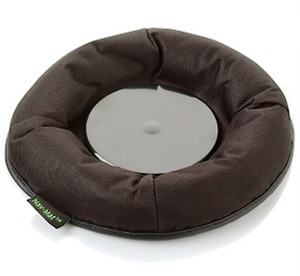 So they’ve come up with the Nav-Mat, which basically looks like a beanbag for your satnav. It sits on the dashboard, therefore preventing those “tell-tale sucker marks”. Apparently “the contoured and weighted, anti-skid underside stops the device from sliding and, unlike traditional window mountings, leaves no suction marks on the windscreen”. It’s available here for a bargain £19.99 (plus £5 p&p). Alternatively, buy some window wipes here for 99p. The forces of Navman and Mio have united to form the imaginatively titled company known as Mio Navman. Well, it could have been Navman Mio, couldn’t it? Whichever way around, this personal navigation device conglomerate has launched a range known as the Navman Spirit. We’re looking at three core models with a few variations in between but essentially, we’re talking about the 3.5-inch Spirit 300, the 4.7-inch Spirit 500 and the 4.7-inch ultra thin Spirit Flat. Each comes with a GPS link to the ATIS traffic service to keep you warned of any hotspots as they happen and your route guidance will adjust accordingly. You get Trumap views, meaning there’s more of a 3D angle on the display for a more obvious look at the road; NavPix photo navigation using images uploaded to the system by the community and they’ve added a walking mode too. One of the nicer new touches is the Explore mode which lets you take a quick look at what attractions are in your local area and the larger models feature a Google search. It works by Bluetooth with your mobile and using whatever data services your phone can manage – tethering, basically but you only get that with the Spirit 500 and upwards. The most important improvement for me, though, is the touchscreens which actually work this time around. They’re smooth, effortless and you can change between the Spirit Slide Touch or button press only. And, yes, that does mean it’ll pick up all 36 Freeview channels. Driving green is totally different to driving fast, and the Econav, from Vexia, knows it. 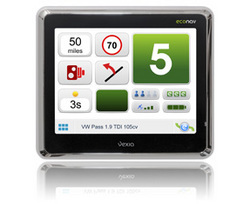 The Econav will deliver you exactly the same speed, traffic and gear change info as a regular sat nav, but instead of showing you the fastest way to go, it’ll show you the most economical. For example, if you’ve got a carful of people, then it’s going to be much better for you to use a motorway than country roads. It’ll take into account your car, fuel and occupancy level. The manufacturers claim that it’ll pay for itself in reduced fuel usage within six months. The price? £200. If you’re not often in a hurry, then it could be worth a look. Garmin, maker of satnavs, and Asus, maker of the Eee PC, are teaming up for an assault on the smartphone arena. They’ve just announced an alliance to design, manufacture and distribute location-centric mobile phones. They’ll be called the Garmin-Asus nüvifone series, and will be on the market before the end of the year. The idea is pretty simple – when you’re in the car, it goes into a dock and works as a satnav, but when you get out, you take it with you and it works like a phone. Garmin already has a product that does this – the nüvifone, which will be rebranded as the nüvifone G60 and delivered in the first half of this year. Beyond that? Well, we’ll have to wait and see. So, go on then, guess how a mobile phone app can tell if you’re driving or not? Speed of texting? Pauses while texting? More errors than usual? Drastic directional adjustments detected by the iPhone’s accelerometer as you hastily steer away from the bus stop, off the pavement and back onto the road? 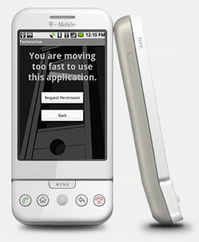 Nope – Texecution uses GPS to locate the position of your phone, and therefore you, deactivating the phone’s SMS features when you seem to be moving at more than 10mph.